Montage facile et assez rapide. Super produit même pour les jeunes enfants. Protective skirt There are 14 products. Double function safety skirt for round 3.90 m trampoline: controlling access under the trampoline and keeping your personal belongings safe. Protective skirt for round recreational trampoline of 4.30 m in diameter with 5 pockets included. Protective skirt for round trampoline of 4.60 m in diameter, preventing access under the trampoline, with shoe bag included. Polypropylene skirt for round trampolines of 4.90 m in diameter, preventing children from playing under the trampoline, with storage stitched to the skirt. Low protection with shoe bag, for the Ovalie 490 trampoline, preventing access under the trampoline. Safety skirt for octagonal Waouuh 360 trampoline with pockets included. Protective skirt for Waouuh 390 trampolines with integrated storage. 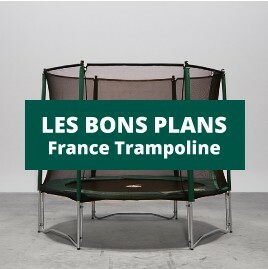 Skirt preventing access under your 4.60 m in diameter trampoline with integrated storage. Protective skirt with pockets that stops anyone from going under the trampoline. Safety skirt which stops passage beneath the trampoline, shoe bag included. Prevent your children from going under your Apollo Sport 500 trampoline with this safety skirt + shoe bag.